Haridwar (Uttarakhand): Yoga guru-turned-tycoon Baba Ramdev has just set the bar higher for his consumer products business— ₹ 1 trillion ($14.9 billion) in net sales, a target he thinks can be reached in 10 years, if not five. The bearded 50-year-old yoga guru has no doubt at all that Patanjali Ayurved Ltd, which he set up in 2006, will get there; it’s just a matter of time. “It’ll happen naturally. I don’t dream, I only work," Ramdev said in a rare interview on 24 May in Haridwar, the north Indian Hindu holy town on the banks of the Ganges, which houses the headquarters of his business empire. The target is a 20-fold increase from the ₹ 5,000 crore in net sales that Patanjali posted in the business year that ended on 31 March. Next stop: ₹ 10,000 crore in net sales in the year to next March. Staff at the Patanjali Ayurved fruit juice packaging unit. The breadth of Ramdev’s ambition can be gauged from the fact that Hindustan Unilever Ltd (HUL), the local unit of Anglo-Dutch consumer products giant Unilever Plc., which has been around in India since 1888, hasn’t even touched one-third of Ramdev’s target. In the year to 31 March, HUL posted net sales of ₹ 32,482.72 crore. 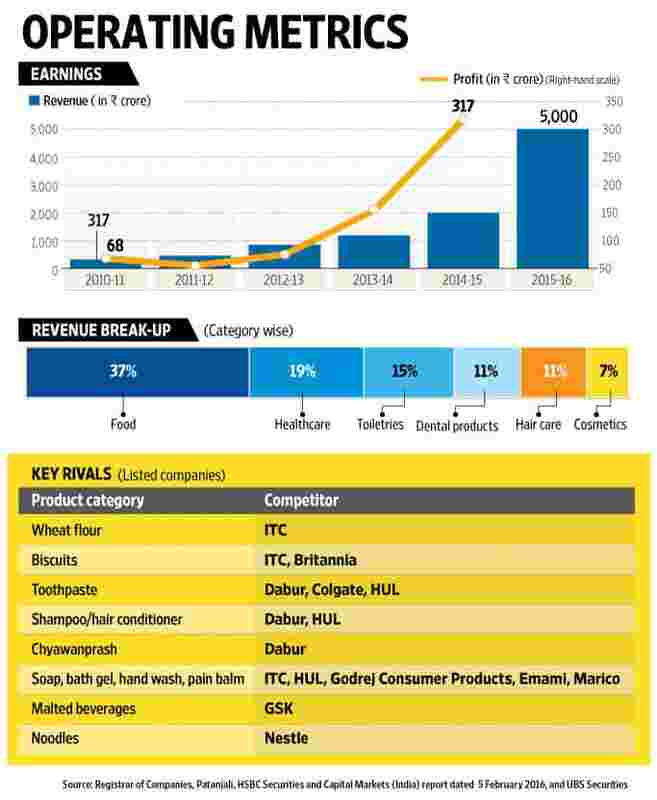 The target also represents a third of the size of India’s entire packaged consumer products market at present, estimated at about ₹ 3.2 trillion a year and projected to grow 12-15% annually over the next five years, reaching ₹ 6.1 trillion in 2019, according to a September 2015 report by industry lobby Federation of Indian Chambers of Commerce and Industry (Ficci) and advisory firm KPMG. Staff at the Patanjali Ayurved hair oil packaging unit. Sales have multiplied 11-fold from ₹ 446 crore in 2011-12. “People trust us, and that’s what is making Patanjali big," Ramdev said in the 24 May interview with Mint at Shant Kutir (peace cottage), his abode, dressed in saffron robes and sitting cross-legged on an over-sized chair. “We are not into small things. Whatever we do, we multiply—be it yoga, be it ayurveda and now business." “Today, more than one billion people know me in this country, and the whole world knows me. Our promise is we’ll never ruin the trust people have in us, come what may," he said. Shant Kutir is a gated property spread over a couple of acres, and the cottage was built in 2009-10, modelled partly on Mahatma Gandhi’s Sabarmati Ashram in Ahmedabad, Gujarat. The compound has no air of the frugality that Mohandas Karamchand Gandhi, India’s independence hero, famously practiced. It is guarded 24x7 by the Central Reserve Police Force (CRPF), has a man-made water well and an artificial waterfall and watch towers. Neatly manicured lawns surround the main cottage. The cottage itself is air-conditioned, with Persian-design carpets and cushioned sofas in the room where Ramdev receives visitors. Customers at the sales counter of Patanjali Ayurved’s factory in Haridwar. Ramdev, who is driven around in a white Range Rover Evoque, initially found fame as a yoga evangelist, teaching the benefits of the Indian physical and spiritual discipline through television channel Aastha since 2000. “Business is a byproduct," he said in the interview. “The Patanjali brand, prosperity and profit—everything is a by-product." Ramdev downplays his own role in building Patanjali into an emerging consumer products giant, saying his only role is that of a brand ambassador who works for free in television commercials representing the brands his company makes. Even so, it’s clear that a razor-sharp business brain is deftly charting the future of Patanjali Ayurved. The rise of Patanjali may be backed by the faith that Ramdev’s millions of disciples repose in the yoga guru, who, in 2011, briefly became a crusader against government corruption and had to hurriedly leave the Ramlila Maidan in Delhi dressed in a salwar suit lent by a female follower to escape a brutal police crackdown. But there’s also something beyond reliance on blind faith. Patanjali knows where exactly it is headed and what it should do to get there. The Entrance of the Patanjali Yogpeeth in Haridwar. Over the next few years, Patanjali will focus on six areas: natural medicine, natural cosmetics, natural dairy products and food, natural cattle feed and feed supplements, bio-fertilizers and bio-pesticides, and natural indigenous seeds, said Ramdev. In April, Mumbai-based Pittie Group, the nationwide distributor for Patanjali products, sewed up a distribution arrangement with Apollo Pharmacy. It also has a marketing arrangement with Kishore Biyani’s Future Retail Ltd for selling Patanjali products in 243 cities across India. Patanjali Ayurved has also teamed up with billionaire Mukesh Ambani’s retail chain Reliance Retail to sell its products. Over the next year, Patanjali will increase its retail presence through 4,000 distributors, more than 10,000 company-owned outlets, 100 Patanjali-branded stores and supermarkets, the company said in a statement recently. Over the next five years, Patanjali will set up six more factories in other parts of the country, Ramdev said, declining to divulge investment details. Patanjali currently has three factories and a bunch of contract manufacturers. The Packaging and despatch centre at the Patanjali Ayurved plant in Haridwar. Acharya Balkrishna, Ramdev’s close confidant and managing director of Patanjali Ayurved, said in a press conference on 27 April that the company will spend more than ₹ 1,000 crore to set up new production units and ₹ 150 crore on a research and development facility. “We’ll employ about 500,000 people once all these factories are built, besides the indirect beneficiaries," says Ramdev. To build the factories, Ramdev said, Patanjali is buying land everywhere at “market price". Patanjali’s expansion is backed by a high-powered marketing campaign led by Ramdev himself. Between January and March, Patanjali Ayurved doubled the number of advertisements it airs on TV channels, according to data from television viewership measurement agency Broadcast Audience Research Council India, or BARC. Patanjali’s weekly ad insertions on television jumped 102% from 11,897 in the first week of January to 24,050 in the week ended 25 March, according to BARC. Ad insertions by Patanjali are 20% more than those by the next most-advertised brand on TV—Cadbury, a chocolate brand owned by Mondelez India Foods Pvt. Ltd. According to Anuja Chauhan, creative consultant at advertising agency JWT India and a writer, “Patanjali is riding on Ramdev’s huge fan following. The company got two things right—one, the whole India-ayurveda connection and, second, the MNC style of advertising." Baba Ramdev with the managing director of Patanjali Ayurved, Acharya Balkrishna. His own channel, Aastha, is a handy marketing tool as well. On a typical day, Ramdev wakes up at 3.30am and starts his day with gooseberry juice, rich in vitamin C and considered a great immunity booster in ayurveda—the ancient Indian system of medicine. By 5am, he reaches his yoga ashram, Patanjali Yogpeeth, a couple of kilometres from Shant Kutir, to conduct a yoga session that is televised live. The yoga session lasts a couple of hours. On this particular day, Balkrishna joins him during the session to talk about the “goodness" of Patanjali products. Ramdev and Balkrishna converse about how good Patanjali’s cattle feed is and how they can double the milk output of cows. Listening to them are more than a thousand middle-aged followers from the farming community who are attending a five-day yoga camp (attendees pay a fee of ₹ 1,000-2,000 per day for such yoga camps), besides millions of television viewers. A new range of cattle feed will be launched soon, the duo says. According to Ramdev, Patanjali already sells about ₹ 150 crore worth of cattle feed a year and expects to cross the ₹ 1,000-crore mark this year. Patanjali’s day-to-day operations are overseen by Ram Bharat, 38, who works from a huge wood-crafted office at the company’s factory in Padartha, an industrial zone in Haridwar that is spread over 150 acres. Participants during a yoga session in Patanjali Yogpeeth in Haridwar. Bharatbhai, as he is called, is Ramdev’s younger brother. He refuses to be photographed, and rarely consents to interviews. According to managers at the factory, he is easily accessible when it comes to business. Bharat first came into the limelight in May last year when he was sent to judicial custody on charges of instigating a clash between a Haridwar truck union and guards at the factory, which ended in one person’s death and injuries to four people. He declined to meet Mint. On the other hand, multiple people at Patanjali believe the business brain behind Patanjali’s success is none other than Swami Muktanand, a director at Patanjali. However, Muktanand’s whereabouts are not known. The corporate communications professionals at Patanjali and management personnel declined to give any details, and requests for an interview were declined. Analysts at top securities houses have taken note that there’s a serious player in town; for an unlisted company, that’s quite an achievement. “The company’s business model is rewriting the rules of consumer marketing in India. We think rapid growth will continue, driven by an ever-increasing consumer demand for its products; the launch of new categories; and a broader retail and distribution network (two thirds of revenue comes from northern India)," Amit Sachdeva, an analyst with HSBC Securities and Capital Markets (India) Pvt. Ltd, wrote in a report dated 5 February. “The success of Patanjali has raised investor concerns about the impact on established consumer names," Sachdeva wrote. Ramdev openly ridicules his multinational competition. “It’s just the start. Ab tak Colgate ka toh gate khul gaya, Nestle ka toh panchhi urne wala hai, Pantene ka toh pant gila hone wala hai; aur do saal me, Unilever ka lever kharab ho jayega (By now, Colgate’s gate has opened; Nestle’s bird has flown (a reference to Nestle India Ltd’s logo), Pantene’s (a shampoo brand by Procter and Gamble India) pants are going to get wet, and in two years, Unilever’s lever will fail)," Ramdev said on 27 April at a press conference in Delhi. In a 11 January 2016 report, Credit-Suisse Securities (India) Pvt. Ltd analyst Rohit Kadam wrote that Patanjali’s “meteoric rise" had hurt Colgate-Palmolive (India). The sales of Colgate’s toothpastes slowed from an annual growth pace of about 10% to just 1% in the quarter ended December as Patanjali’s Dant Kanti made inroads, he wrote. HUL, Colgate and Procter and Gamble declined comment for the story. Nestle India Ltd chairman and managing director Suresh Narayanan said he believed “disruptive competition is always good to have". “Competition energizes me. I firmly believe every company play on its strengths. Our strength is nutrition, science, health and wellness. That’s what we are all about. We are good at these, and we’ll be playing to it. Let’s focus on what we need to do and get that right," he added. Cigarette maker ITC Ltd, which branched out into foods, home and personal care products in 2001 and reported sales of ₹ 9,704.40 crore for the year ended 31 March 2016, is also aware of the formidable competition posed by Patanjali. “We have taken note of Patanjali’s rapid growth and are recalibrating our strategy," V.L. Rajesh, chief executive (foods business), ITC, said in New Delhi on 19 May. To be sure, there are concerns about some Patanjali products and scepticism about some of its claims. In May, the Advertising Standards Council of India (ASCI) found “gross exaggeration" in the commercials on hair oil, mustard oil and washing power made by the company. Baba Ramdev is driven around in a Range Rover Evoque. The Patanjali factory in Padartha is guarded by the Central Industrial Security Force (CISF), and most areas are off-limits to the media. With Ramdev’s permission, this reporter was allowed to visit some parts of the factory. Patanjali claims to make natural ghee (clarified butter) from cow milk. At the factory, pasteurized unsalted butter produced by the Karnataka Co-operative Milk Products Federation Ltd was being mixed with local cow milk to produce ghee. The aloe vera unit is a processing and packaging unit, which was using pulp supplied by Dhandev Resorts and Health Care Pvt. Ltd (a Jaisalmer-based company owned by Roop Ram, an Indian National Congress leader). Patanjali claims that it has its own aloe vera plantations for making aloe vera juice. And contrary to Ramdev’s claims, Patanjali outsources manufacturing of some products like other packaged consumer products companies do. For instance, biscuits are made by Delhi-based Sona Biscuits (that also sells biscuits under Sobisco brand) and juices by a bunch of companies, including GK Dairy and Milk Products Pvt. Ltd (this company also sells products under the Gopalji brand). Patanjali’s juice products, which Ramdev claims to be natural, contains added sugar, water and required preservatives. Haridwar-based Aakash Yog Health Products Ltd manufactures noodles for Patanjali. Aakash used to make noodles for HUL’s Knorr brand, till recently. Some of these names are mentioned in the fine print of product packets. Mint confirmed these with the managers at Patanjali’s Padartha factory. None of the companies above responded to emails seeking comment. According to Ramdev, Patanjali has more than 200 scientists who research and develop its products. These scientists are barred from meeting outsiders. “We can’t divulge the formulations and what we are developing," said Vineet Gupta, a senior manager, declining a request by this reporter to meet the scientists. One analyst, who has visited Patanjali factories multiple times and spoke on condition of anonymity, says Patanjali products are essentially herbal clones. “The process is simple. Top-selling products across brands are picked up from the market and then similar products are developed based on herbal formulations under Patanjali brands. Mostly, they are replicas of successful products of multinational companies," the analyst said. Sachdeva of HSBC is more charitable. “About 85% of all production is done in-house, and Patanjali is looking to replicate the success of its first food park in four other cities, including Nagpur in Maharashtra. Patanjali is also using e-commerce channels to distribute its products across India and is appointing new distributors to expand its footprint," he wrote in his report. Ramdev says the plan is to build six more factories, each as big as the one in Padartha, and move into new areas like handlooms and organic farming. People who work at Patanjali profess to have joined the company to promote a “good cause"—a movement that Ramdev calls “swadeshi andolan" (literally, indigenous or local protest, a movement for freedom from the clutches of MNCs). “I did not join here for money. I feel honoured to join Patanjali, to be a part of Swamiji’s movement for a good cause," says Ajay Bhandari, general manager (quality control), who joined Patanjali this year after a 21-year career in different established firms. Patanjali, which Ramdev says is a zero-debt company, is right now selling everything it is making. Managing director Balkrishna said in May that there is a huge gap between domestic demand and supply. Sri Sri Ravi Shankar vs Baba Ramdev: the new consumer product war? Patanjali exports products to the UK, US, Canada and Mauritius, which are home to large Indian populations. Nivedita R. Nathoo, who is the sole distributor for Patanjali products in Mauritius, said the products fly off the shelves even in the island republic. He may be promoting Patanjali products with an evangelistic zeal, but Ramdev claims he himself doesn’t use any of them. At Shant Kutir, guests are served freshly squeezed mosambi juice. And the man who is out to build the next consumer products giant out of India says he doesn’t view buyers of Patanjali products as consumers. “We have changed the rules of manufacturing, packaging, marketing. We don’t consider them to be consumers. We take them as part of our families. Consumerism is not our culture," he said. Ramdev is perceived to be close to India’s ruling coalition, and has appeared with Prime Minister Narendra Modi on several public platforms. But the yoga guru disclaims any interest in politics. “I want to stay the way I am—sanyas, rashtradharma... (renunciation and duty to the nation) I want to do everything without any greed. Directly, I’ll never participate at any political position," concludes Ramdev. He picks up his Micromax mobile phone, puts a pile of papers into his saffron bag, boards his Range Rover and rushes for his next meeting, leaving many questions unanswered and unasked, at the peaceful Shant Kutir.